Add milk and beaten egg to the bottom of bread machine loaf pan. Then add in flour, ensuring covering the liquid. Make a indentation in the middle and add in yeast to the indentation. Then add in milk powder, sugar, salt and butter around on the top (be sure salt and sugar are at opposite side). Select “Dough” course and press “Start”. 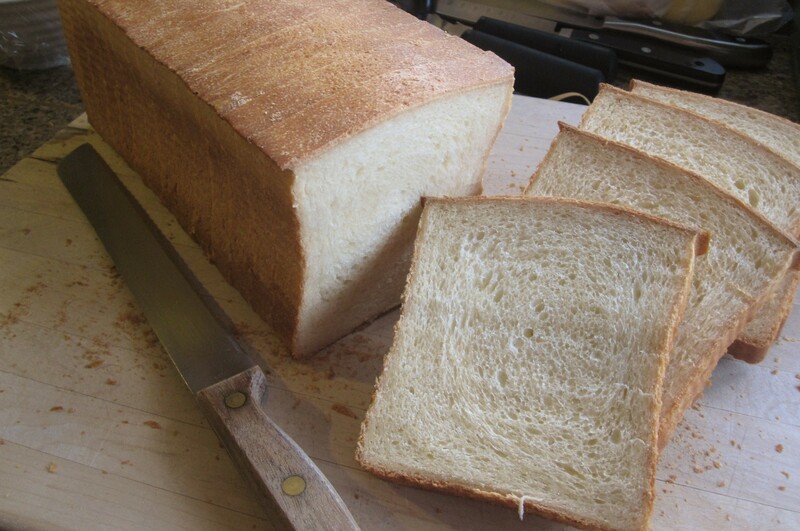 When the course finishes, take the dough out of bread machine and place in a large bowl. Cover with plastic wrap and rest the dough in a warm place until double in size ( I sit the bowl on top of a pot filled with 2 inches warm water). Remove dough from bowl, punch down slightly, then roll out to a rectangle shape, to the length of Pullman loaf pan. Roll up the dough like a jelly roll. Place bread dough inside a greased Pullman loaf, cover with plastic wrap. Let the dough rest until it’s 1/2 inch to the rim. Meanwhile, preheat oven to 350°F. Carefully place the cover on the pan. Bake for 25 minutes, positioned in the middle of the oven. Carefully remove the loaf pan cover, and bake for another 20 minutes. Remove bread from pan and cool completely on the rack. 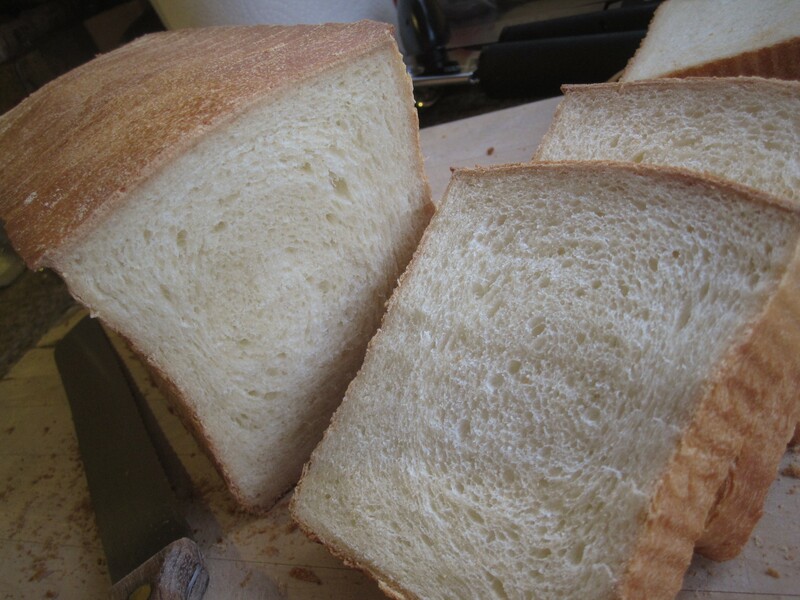 The bread looks great, but some parts of the crumb is denser than others. My theory is that maybe the bread has no where to expand during baking because the lid was on the pan. Maybe cutting down bread flour by 1/2 cup next trial so hopefully the bread will have more room to expand during baking and yields a fluffier crumb.